I’ve been near-drowning in tacos lately. Which sounds odd, but bear with me. For well over a week, I’d been playing around with my Foolproof Grain Free Tortilla recipe, so after the ten-plus test batches I’d made… we had a lot of tortillas in the house. Which, unsurprisingly in a formerly taco-deprived household, meant I was inundated by requests from my husband for tacos. Did I mention that he lived the vast majority of his adult life in Texas? The man loves his tacos. Now, me, on the other hand? Girl hadn’t ever eaten a taco until eight years ago. Fun fact: tacos were the first food I ever ate in the States. I told you my dude likes tacos. He thought they’d be the perfect “everybody likes these” meal, but hadn’t gambled on the fact that I had no idea what a taco was, much less how I was supposed to assemble my own while deep in jetlagged brain mode. Don’t worry, though, I’ve upped my taco game since then! Now, when it comes to these Chicken Salsa Verde Tacos, I’ve gotta admit I’m really proud of them. But they are the love child of my leftovers after I made a batch of my Roasted Green Onion Salsa Verde last week. Someone who made that recipe left a comment that it tasted just like tomatillo salsa and so I thought that was the perfect reason to toss it together with the leftover roasted chicken I also had in the fridge. Warmed through and piled into skillet toasted tortillos, we scarfed them down like the formerly chicken taco deprived delinquents we were. Once the post-taco-inhalation-daze had passed, I got to thinking about what would gussy up those salsa verde tacos even more. I decided they needed some crunchy vegetables to contrast with the tender chicken, so I brought some basic coleslaw mix into play as a base. Now, I’ll admit I’m a raw onion fan and will usually plant plenty of sliced or diced onions on top of my tacos, but for this I wanted something a bit more mellow that wouldn’t overpower all the salsa verde goodness. So I decided to quick pickle some red onion in a little lime juice and salt to add as a garnish. This is a really speedy and simple trick. The lime juice bath isn’t a true pickle, but it simultaneously adds a zingy freshness from the citrus and a tamed-down onion-y pungency that complements rather than overpowers all the other flavors and textures. 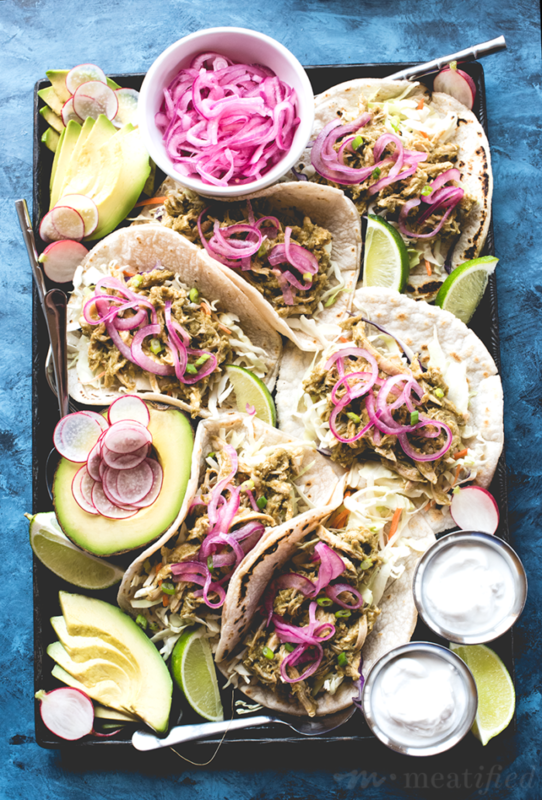 As a bonus, the red onions turn a glorious hue of pink as they sit in their little lime juice marinade, which makes for a really pretty presentation when piled on top of tacos as a finishing touch. Although there are a lot of different components here, you can make this meal weeknight friendly by making the Roasted Green Onion Salsa Verde and even the Foolproof Grain Free Tortillas ahead of time. (If you’ve made some reintroductions, you may also be able to swap the homemade tortillas for a commercially available GF / Paleo tortilla, too). You could also make the lime pickled red onions ahead of time, since they’ll keep for up to a week in their brine in the fridge. 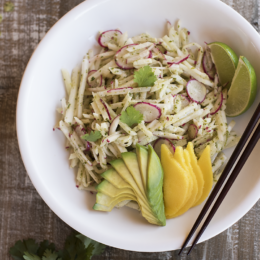 You can save extra time by using leftover or rotisserie chicken and pre-chopped coleslaw mix rather than chopping your own. If you’re making everything as set out in the recipe, you’ll get the onions marinating first, then set the chicken salsa verde warming through on the stovetop. While your skillet is heating up to get your tortillas all toasty, you can prep any extra toppings you like. By the time you’ve gotten your tortillas all warmed up and ready to top, your chicken will be hot and the onions pickled! Then you just need to assemble your salsa verde tacos. I have you reheating the chicken for the salsa verde tacos in the salsa, along with a little extra chicken broth to stop the chicken from drying out. When you’re ready to assemble your salsa verde tacos, make sure to use a couple of forks or a slotted spoon to add the chicken to the taco base. You don’t want to bring along too much cooking liquid as that will make the tacos soggy. That’s it — tacos away! You’d never guess that the chicken salsa verde in these tacos is nightshade free. This is the perfect allergy friendly recipe — it’s grain, gluten, nut and egg free — but more importantly, it packs a punch of flavor. Taco night is back! PICKLE: Finely slice the onions about 1/16″ thick or as close as you can get them. Add the sliced onion to a bowl along with the lime juice, salt and oregano (if using). Toss to coat them in the lime mixture. Let sit for 15 minutes or so, tossing every 5 minutes until the onions begin to soften and take on a pink color. Transfer the onions and all the liquid to a jar and gently press the onions down into the brine. Cover and leave them to continue pickling as you work on your tacos. WARM: Add the chopped or shredded chicken to a small saucepan, along with the Roasted Green Onion Salsa Verde and a couple of splashes of chicken broth. Stir to combine, then add additional salt, to taste. Warm the chicken over medium low heat until thoroughly reheated, but don’t allow the pan to dry out. Add a little extra chicken broth, if and as needed. TOAST: Unless you’ve literally just made my Foolproof Grain Free Tortillas, you’ll want to toast them up a little before serving. Preheat a cast iron skillet over medium high heat. Once the skillet is hot (test with a few drops of water first), add the tortillas one at a time to reheat, flipping to the second side once the tortilla is warm and crisp to the touch. When both sides are hot and have some nice golden brown – or even char – marks, transfer to a cloth lined surface so that they keep warm, but don’t become soggy. Repeat until all of the tortillas are done. ASSEMBLE: Once the chicken is reheated thoroughly, you’re ready to assemble your tacos. Transfer the warmed tortillas to plates, then top each one with some of the coleslaw mix. Use two forks or a slotted spoon to divide the chicken evenly between the tacos — you don’t want to bring too much cooking liquid with the meat, or the tacos will be soggy. Top the salsa verde chicken with some of the lime pickled onions and any other additional toppings you like, then enjoy! STORE: You will likely have some leftover lime pickled onions leftover. You can keep those in an airtight container in the fridge for up to a week. Rachael! You have just consistently blown my mind lately. I’m so stunned by your gorgeous photography! And your recipes – so freaking creative! I can’t wait to try lime-pickled onions…pickled veggies are one of my favorite taco toppings, but I’ve only ever pickled stuff with vinegar. Excited to try something new! They’re the best! Lighter and fresher, but still tangy and fun to eat. Thank you so much, Chelsea! I am loving these photos! Definitely want this platter of goodness in my life. I’m planning to try your grain-free tortillas soon! Thank you so much, Becky! My husband ate almost the whole platter as soon as I stopped taking photos, haha! Made these beauties last night and my daughter and I loved them! The tortillas are ah-mazing and so easy! Made them with Amy’s avocado oil, and while my daughter loved the flavor, I found it a bit strong for my tastes. I’m going to try these with pork lard next time as you suggested. We loved the Roasted Green Onion Salsa Verde flavor but mine came out very runny. I added some avocado and blended it which helped a lot and we both loved the flavor. So, since I’m trying to determine what I did wrong with the Salsa, was I supposed to add the green onion tops in with the green onion white ends? I roasted them all, but after they cooled, I cut off just the white ends and chopped them as instructed. I also only had a 5-ounce package of them versus a 12-ounce, so that may have been the problem? I would appreciate your thoughts on this! And, again, thank you so much for this awesome recipe! This is such a great way to use leftover chicken from when i roast a whole chicken! 1) I’m not familiar with Amy’s brand avocado oil, it sounds like it might be a less refined avocado oil, which has a much stronger flavor. (As a side note, if that’s the case, it’s great for making AIP “mayo”!) I tested mine using the Chosen brand, which is really very neutral in flavor and may work better for you here if you found it a bit too strong. 2) The runny salsa — this is probably at least in part my fault in the wording, I’m so sorry! I need to go back at how I phrased this, but I suspect that I was unclear with how much of the end to chop off. I didn’t mean for you to chop off and remove all of the white parts of the onions, just the tips with the roots attached, since you wouldn’t want the roots getting in on the blender action. So, to clarify, you just needed to remove the root tips at the bottom of the onions — the rest of the white parts get blended up with everything else. I’ll go back and make this clearer in the original post, thank you for bringing this to my attention! 3) If you used a 5 oz package of green onions and scaled the other ingredients, too, then the result would come out the same, but you’d just have less salsa yielded when you were done. If you used 5 oz of green onions instead of 12 oz and kept all the other ingredient amounts the same, it would have come out on the runny side because you didn’t have enough pureed green onion to balance out all the chicken broth. Does that makes sense? Thank you so much for your feedback! I’m glad you enjoyed it in the end — the avocado addition to make things extra creamy sounds great! Just made your Roasted Green Onion SalsaVerde. My dear, it is truly amazing! I can’t thank you enough for this one. You could bottle it and sell it and become wealthy. What a talented chef you are. I use an ( accidentally AIP) recipe by Tom Colicchio of Top Chef fame, but your salsa verde beats his version – no contest! Sheila, I’m so happy to hear you enjoying this recipe, it’s one of those that I’m most proud of, so I’ll admit I get super excited to hear that other people love it, too 🙂 I would love to look into a project like that (I think perhaps my “cheese” sauce and nightshade free bbq sauce would bottle well, too), but I confess I have no clue where to start with something like that!